It is not exactly a "looker,” but buying a used Volkswagen Thing is about much more than its appearance. Unique would be the best term to use when referring to this vehicle’s style. The Volkswagen Thing was made available in North America in 1973. Approximately 140,000 models were produced between 1969 and 1980 with about 25,000 being shipped to the United States in 1973 and 1974. When buying a used Volkswagen Thing your color choices are limited. Originally this 4 door convertible came in only Blizzard White, Sunshine Yellow and Pumpkin Orange. 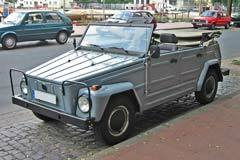 The aforementioned uniqueness of the Volkswagen Thing is found in features such as a folding windshield and detachable doors that were interchangeable from front to back. If you live in a cold weather climate you may want to be sure to get the optional gas interior heater which connects directly to the fuel tank. Inside there is an opening in the dashboard that passes for a glove box. Under the hood you will find an air cooled, 46HP flat four cylinder engine that is mated to a manual 4 speed transmission. Buying a used Volkswagen Thing is not for everyone and it may not be the right choice for a family with children. However, if you are looking for fun and a lot of attention this is the car for you.